THINGS THAT COME INTO MY HEAD. SOMETIMES YOU MIGHT EVEN SPOT LINKS BETWEEN THEM. Bitcoin is difficult to get your head around. But the general confusion invariably boils down to questions like “But what is it linked to?” and comments like: “It’s just too abstract”. Lets look at the abstraction part. If there is one process that has defined the evolution of money since the beginning of time, it is abstraction. The only time there was zero abstraction was right in the beginning when people bartered goods. In a barter economy the”money” is the thing you are bartering. There is no separation between money and goods. But such a system is highly inefficient, and evolution eventually casts the inefficient aside, ushering in more efficient systems. Precious metal coins proved more efficient than trading goats for wine, and although the coins themselves still held intrinsic value (the silver or gold in the actual coin), the new system was already one step removed from the actual things been bought and sold themselves. This step to coins then was the first abstraction. Over the centuries gold coins began revealing inefficiencies of their own. They were heavy to carry (especially if you had lots) and attracted thieves. Hence the first “banks” began to appear – nothing more than safe-houses where you could “deposit” your gold coins in exchange for a paper receipt noting the amount of gold coins you had deposited. It didn’t take long from there for merchants to realise that they could trade their receipts without making a trip to the bank every time. This marked the birth of paper money, and with it another level of abstraction – paper standing for gold in banks and gold in banks, in turn, standing for the goats and wine that could be bought. Paper money as receipt was a far more efficient system and retained its link to gold all the way until 1971 when Nixon finally took the US Dollar off the Gold Standard. Under the Gold Standard, every bank note issued had to have a certain percentage of gold stored in the issuing country’s reserves. This prevented governments from printing more paper money than they had gold to back it up with. It also provided security to holder of the bank note, because by law they could theoretically demand to exchange the paper money for gold at any time. But in 1971 this link was totally severed. From that day onwards nothing was left to back the paper money other than “trust in your government”, a trust that people are realising is easily broken. This brings us back to the first objection to bitcoin which I cited at the beginning of this article: “But what is it linked to?” What a lot of people don’t realise is that with the ending of the Gold Standard modern currencies are not linked to anything themselves. The link between paper (the receipts for the gold) and the gold itself was totally severed. Indeed, some economists lay the blame of the world’s current financial mess precisely with the departure from the Gold Standard. Investment in gold is still recognised as one of the only “safe haven” strategies in times of crisis. As our current world lurches from one financial crisis to the next the gold’s status, as the last “real” currency is finding favour . There is growing consensus that the current financial system is somehow broken. One could argue that in the 1970s the evolution of money took a wrong turn and the gold advocates are effectively saying “OK, well lets dial back to the last version that actually worked, and repair the link between paper and something tangible”. The recent introduction of Bitcoin as an alternate currency gives us another option though. Bitcoin is undoubtedly a more efficient system than the existing mess world currencies are in. Instead of going backwards to what worked last century, we can take a brave leap forwards and embrace the next step in the evolution of money. Yes, Bitcoin is abstract. Yes, it is not linked to any gold bars buried deep inside some Fort Knox. It doesnt pretend to be. But when it comes to efficiency it is quantum leaps ahead of anything else. Any amount of Bitcoin can be instantly and directly transferred to any person on the planet for no more than the cost of an email. No bank tellers, no middlemen, no paperwork, no foreign exchange departments. Micropayments, which the internet economy has been crying out for ever since its beginnings, can finally become a reality. There will definitely be those that try to derail Bitcoin. Inefficient systems always skew the rewards to those controlling the system, so there is much to lose. You can rest assured that there is an agitated group of central bankers sitting in a boardroom plotting Bitcoins demise right now. But nobody ever turned back evolution, not even Governments, and in this writer’s opinion nobody ever will. .. If you haven’t heard about Bitcoin yet – the new “opensource” digital currency – brace yourself, because you’re gonna! The actual mechanics of Bitcoin are fairly technical to grasp at first but explaining them is not within the scope of this, my first article on the matter. Lots has been written elsewhere and there is no shortage of info for the eager enquirer (with the Wikipedia link above being a good place to start). All that you have to know for now is that bitcoin is a new digital currency that can be converted at a fluctuating market-determined exchange rate to USD dollars (presently approx 90USD to 1 bitcoin) and most other major world currencies. It is not controlled by any one institution or government and its issue and supply is 100% transparent for the whole world to see. Bitcoin is nothing short of revolutionary. Indeed, the description “open-source monetary system” would be more accurate than just “open-source currency”. And that is exactly where its potential lies. Ever since its beginnings 2 decades ago the internet has totally disrupted the archaic, inefficient, and tightly centralised models of yesteryear’s industires. The first industry to succumb was surely music, with Napster’s peer-to-peer model changing the landscape irreversibly. Then came the movie industry, followed by books and publishing in general. Political systems also fell under the power of grass roots connectivity, changing power dynamics forever. Underway at present is the transformation of education and soon the medical industry. So it should come as no surprise then that the most inefficient, costly and centralised industry of the lot – central banking – would eventually appear in the trigger hairs of the grand decentralised model of the world wide web. 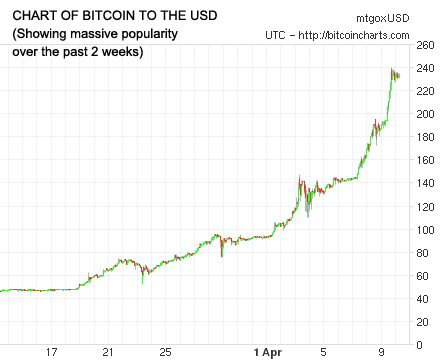 Bitcoin is nothing less than the silver-bullet the Occupy Wall Street movement was looking for all along. Honestly, they can put down their “Occupy” placards now, and replace them with “Buy Bitcoins” instead. The 1%, whose ultimate power rests in the fact that they control the central banks, was never going to be wrested away through political action. Instead, the perfect solution to subvert central banks is to bypass them altogether. Who needs corrupt, greedy overlords when there is a new international, decentralised, peer-to-peer, totally transparent monetary system available to all? To be sure, the road ahead for Bitcoin is not going to be without bumps. Governments and central bankers, who have enjoyed disproportional power for 1000s of years, are not just going to roll over in submission. They will throw everything they can into the fight. So expect smear campaigns, covert government-sponsored hacking of the bitcoin network and every other dirty tricks campaign money can buy. But it is the opinion of this writer that in the long run its a war they can’t win. Its kind of like open-source software I guess, no single entity can control it. In fact the only strategy that may work is if they entered the bitcoin market themselves and started buying up all the bitcoins they could get their hands on. But eventually this would drive the price of bitcoins so high that it will be impossible even for them – the Free Market system doing its work perfectly! So get ready for the biggest revolution the internet has ever ushered in. And buy your Bitcoins today. I did.